. 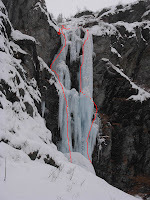 : ICE CLIMBING SEASON HAS BEGUN! ICE CLIMBING SEASON HAS BEGUN! After a "short" holiday in Nepal full of adventures, i came back looking forward to hunt some local ice. Recently doh, the weather hasn't been very kind to climbers. After a dry autumn, snow came late and than rain and rain fairly high up made a big mess, and again snow. Many accidets happend in the past few days because people luking of mountain experience underestimating the actual danger. So we need to be extremely careful with choosing the right line to climb. Quite few waterfalls are there, but just few are relatively safe to climb at the moment. So before heading to the mountains, it would be wise to contact local Mountain Guide offices to have an advise. I am very happy to give suggestions to those who need some, therefore feel free to call. Access: from the MB tunnel take the highway towards Torino and exit at Verres village. Cross the bridge over the river direction HONE-CHAMPORCHER. Past Champorcher village take a left in a corner joining a road going downhill. If you look well in the side valley you can see the exit of the pillar on your left before taking the crossing. Park the car at the end of the road and follow the sumer path going in the Vallone della Legna. At the second signboard cross the river to the left over a wooden bridge. Follow the sumer path and in a 15 min you'll reach the pillars. Right pillar: WI 5+, 2 pitches. Go around the first mushrooms from the right and make belay at the base of the steep wall in the cave. 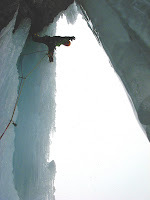 Pitch 2: 30 m go up the natural ice dihedral to exit at the very top on the right of an overhang. Belay on a tree with sling and maillon rapide.